Muhammad ibn Abd al-Wahhab (/wəˈhɑːb/; Arabic: محمد بن عبد ال��هاب‎; 1703 – 22 June 1792) was a religious leader and theologian from Najd in central Arabia who founded the movement now called Wahhabism. Born to a family of jurists, Ibn 'Abd al-Wahhab's early education consisted of learning a fairly standard curriculum of orthodox jurisprudence according to the Hanbali school of law, which was the school of law most prevalent in his area of birth. Despite his initial rudimentary training in classical Sunni Muslim tradition, Ibn 'Abd al-Wahhab gradually became opposed to many of the most popular Sunni practices such as the visitation to and the veneration of the tombs of saints, which he felt amounted to heretical religious innovation or even idolatry. Despite his teachings being rejected and opposed by many of the most notable Sunni Muslim scholars of the period, including his own father and brother, Ibn 'Abd al-Wahhab charted a religio-political pact with Muhammad bin Saud to help him to establish the Emirate of Diriyah, the first Saudi state, and began a dynastic alliance and power-sharing arrangement between their families which continues to the present day in the Kingdom of Saudi Arabia. 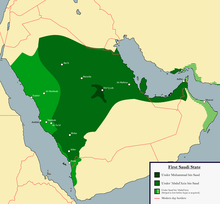 The Al ash-Sheikh, Saudi Arabia's leading religious family, are the descendants of Ibn ʿAbd al-Wahhab, and have historically led the ulama in the Saudi state, dominating the state's clerical institutions.